The Lord has opened doors to ministry in the Eastern Province of Zambia. For three years in a row, CEF of Zambia has been able to do ministry in the small town of Katete- 842km [523 miles] from Luanshya, CEF of Zambia headquarters. Katete is centrally located in the Eastern region of Zambia and surrounding towns in that province have been able to benefit because of the programs which have been conducted there. This province is the headquarters for Islam in Zambia. Apart from Islam, the people have traditions like Gule Wamukulu and Nyau dances. The girls get married as early as 12 years old and the boys are given out to cattle owners by their parents to watch over the cattle owners’ animals. After an agreed period of time the parents of the boy will be given a cow. Meanwhile the child would have become too old to start school in grade 1. This means some of both girls and boys in this area don’t go to school. Those who go to church are highly religious. Beginning in 2014, CEF Zambia has trained 70 teachers to minister in Katete. Out of those teachers, ten students came from the surrounding towns. Over 20,000 boys and girls have been reached just in this area. Because they are in such a rural part of Zambia, there is a great challenge in providing reports. With the training programs which we have had there, it is reported that there has been a lot of transformation in the villages and schools in Katete. As children get saved, behavior change is being seen in the lives of the children. The parents are being witnessed to by their children and some of them are now sending their children to school. Early marriages have reduced and those involved in traditional evil practices are slowly shunning the ideas. The community at large is happy about what is happening in the Good News Clubs which have been opened in that area. 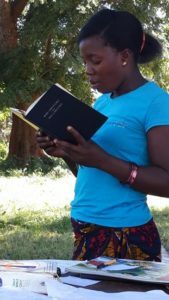 Dorothy Mwale, a participant in the recent training in Katete, was excited about training because she said she didn’t know who God is. She thought God was a kind of air which moves in the open space. But to know that God is the Creator, love, holy and lives in Heaven, opened a new chapter for her in her Christian life. Now if an adult can say that, what about the children who have not heard the true Gospel. On the right is Joyce Zulu who did training last year in March. After training Joyce led her father, her two children and her nephew to the Lord. She also led her fellow choir members to Christ. Joyce is a very hard working volunteer who has opened three GNCs with 97, 58 and 92 children respectively. She is very excited to be used of God.